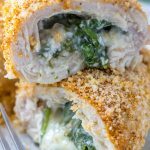 A juicy chick breast is rolled around fresh baby spinach and creamy pepper jack cheese, topped with a crisp Cajun breading and baked to perfection. Use a meat mallet to pound out the chicken breasts until only 1/4" thick. In a medium bowl, stir together the cheese, spinach, salt and pepper. In a separate, small bowl stir together the Cajun seasoning and breadcrumbs until evenly combined. Spoon an even amount of the cheese/spinach mixture out onto the underside of each chicken breast. Starting from the smallest end first, tightly roll each chicken breast up and use the toothpicks to keep it closed at the seams.the seams with several toothpicks. Use as many toothpicks as necessary to ensure a good seal so none of the filling is lost as it cooks. Remember the number used though, so you pull out the same amount before serving. Nobody wants to bite into a lost toothpick! Brush each chicken breast with extra virgin olive oil. Sprinkle the Cajun seasoning mixture evenly over all the rolled chicken, patting down gently to ensure the coating sticks. Lightly grease a baking sheet or dish with non stick cooking spray, and place the chicken seam-side up onto it. Bake for 35 to 40 minutes, at 350 degrees, or until the chicken is cooked through. Let the chicken 'rest' for 5 minutes before removing the toothpicks. Serve the stuffed chicken whole or slice it into medallions.